David Levine will make his second career NASCAR Camping World Truck Series (NCWTS) start, and his first NCWTS start at Daytona International Speedway, on Friday February 19th in the Next Era Energy Resources 250. Levine will be behind the wheel for MAKE Motorsports in the No. 1 Chevrolet Silverado. Levine is a Brand Ambassador for Revant Optics and their logo will be clearly seen on his truck. Levine has experience on the 2.5 mile Daytona high-banks from last year’s ARCA Racing Series event at the track, where he had a top 20 finish. The Highland Park, IL native, who now lives in Mooresville, NC, competed full time in ARCA competition last year, ending the season as the highest finishing rookie in the points standings after collecting 11 top ten finishes, as well as four Hard Charger Awards and two Rookie of the Race Awards. 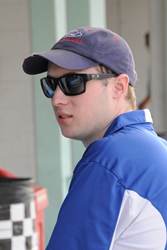 In November last year, Levine made his NCWTS debut in the season-finale at Homestead-Miami Speedway. After qualifying his way into the race in a truck with no owner points, he raced to a 17th place finish. Live TV coverage of the Next Era Energy Resources 250 begins Friday, February 19, at 7:30pm (ET) on Fox Sports 1. Radio coverage of the race will be available on the Motor Racing Network (MRN) and SiriusXM Satellite NASCAR Channel 90. For more information about sponsorship opportunities, email David. Learn more about David by exploring his website at http://www.DavidLevineRacing.com. Catch up with him on Facebook at /DavidLevineRacing and on twitter @1DavidLevine. To read about his personal heart story, visit http://www.DriveForHeart.org.